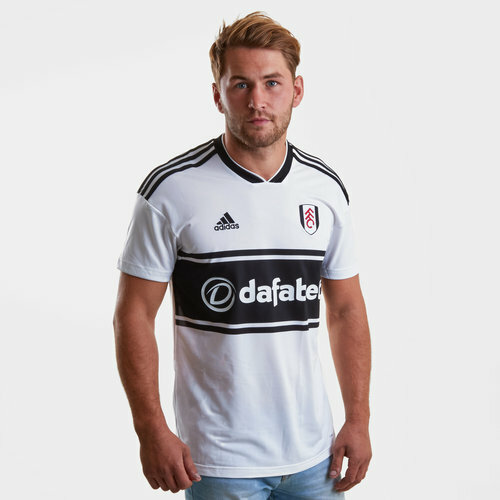 The Cottagers look to make it a successful first season back in England's top flight league of football so show your support in this Fulham FC 18/19 Home S/S Football Shirt from adidas. The whites now play their football in the Premier League thanks to a victorious EFL Championship play-off final against Aston Villa in May 2018. The victory marked the teams first win at Wembley in their 139-year history. Slaviša Jokanović's men will play their football in an adidas kit and training range for this season. The home kit takes inspiration from the Club’s successful late 1990s period, as well as adidas’ authentic sport look from the 1980s and 90s. The heritage of London’s original football club is weaved further into the kit with a subtle neck sign-off of the Club’s founding year, whilst modern features remain at the heart of the kit, with adidas’ climalite technology. The football shirt is white with 3 black blocks across the middle of the shirt. There is black detailing on the collar and black is also used for adidas' classic 3 stripe motif on the shoulders. The adidas logo is on the right whilst the club badge is on the left. The club's sponsors - dafabet - is across the middle.